Injury to digital nerves of the hand is common and they are the most frequent cause of sensory impairment of the hand . A nerve gap is defined as “the distance between two ends of a divided nerve”. It is not only caused by the nerve tissue lost due to trauma or debridement, but also by actual retraction of nerve stumps . Peripheral nerve injuries with gaps larger than 1-2 cm require bridging strategies for nerve repair/coaptation. There are various reconstruction methods for such significant nerve gaps such as autologous nerve grafts, interposition of venous or arterial segments or interpositions of synthetic conduits [2, 3]. Achievement of satisfactory functional recovery following the repair of a segmental peripheral nerve defect always posed a challenge for the surgeons. It has long been established that the repair of a segmental defect of nerve usually gives very poor results when the nerve coaptation of stumps is done under tension [4-7]. Using autologous nerve grafts for nerve defect bridging is a relatively common procedure employed in hand surgery. In such cases, interposition autologous nerve graft is considered as the gold standard of treatment and is associated with the best outcomes . Even though digital nerve defects are commonly encountered in hand injuries, there are a very few number of reports in the literature regarding lateral antebrachial cutaneous nerve (LACN) as a donor source. The main objective of this study is to evaluate the availability of lateral antebrachial cutaneous nerve (LACN) autograft for acute, segmented or delayed repair of digital nerve injuries in a clinical trial. Table 1. Comparative results (at the end of follow up period) of 2PDT and SWMT between normal parelel finger with inured side, gender, age, the mean time from injury to grafting, defect (gap) length, injury mechanisms, concomitant injury, follow up period. Patients were operated under pneumatic tourniquets inflated to 250 mmHg. Appropriate magnification during the operation was obtained using operation field microscopy. Previous scar lines were extended using zigzag incisions and neurovascular bundles were exposed in patients with chronic injury. Neuroma formations at nerve stumps were resected to expose healthy nerve fascicules (Figs. 1a, b). In acute cases, nerve ends were dissected and were prepared for repair. Following the nerve gap measurement, graft harvesting was initiated. Initially, biceps tendon insertion was palpated at cubital fossa in the forearm in full supine position and a longitudinal incision was done, just lateral to the longitudinal axis of biceps tendon. Fig. (1). Notice the neuroma formation at upper stump of the injury site b . Notice the excised neuroma, the clean stumps was prepared. c. The appearance of lateral antebrachial cutaneous nerve in donor field d. The appearance of repaired digital nerve after autografting with lateral antebrachial cutaneous nerve. Cephalic vein was identified within one cm to the radial side of incision following gentle retraction of subcutaneous fat. Nerves were continuously identified along the course of cephalic vein with ramifying branches in some parts. Nerve graft, a few millimeters larger than the defect, was harvested from its anatomical site (Fig. 1c). Proximal nerve ends were cauterized and buried under forearm fascia. Skin closure was done using interrupted sutures. Mean size of interposed nerve grafts was 18.5 (15-25) mm. All nerve repairs were performed in Zone II. Epineural neuroraphy was performed using 9/0 nylon sutures. (Fig. 1d) Evaluation of procedure-related morbidities was done with percussion throughout the donor and recipient nerve tracts in order to check for Tinnel’s sign, which indicated a neuroma formation. The patients were also examined for sensation disturbances in forearm region, which innervated with harvested lateral antebrachial cutaneous nerve branch and for presence of a disabling scar formation. The return of sensation distal to neuroraphy was evaluated using 2PDT and SWMFT at 3 rd. month and end of follow up period. The SWMT was performed with Touch-Test ™ 20 Piece Full Kit in accordance with instructions of the instrument . Static -2PDT was performed with Touch-Test ® two point discriminator apparatus in accordance with instructions of the instrument . The mean values of 2PDT and SWMT (at the end of follow up period) were analyzed with Paired T test and the results were showed in table (Table 2). Table 2. The mean value of two-point discrimination of injured finger is significantly higher than (worse than) the un-injured finger . (p=0,0001). The mean value of The Semmes-Weinstein monofilament test of injured finger finger is significantly higher than the un-injured finger . (p=0,0001). The correlation between the defect length and the % difference of 2PDT and SWMT values between the uninjured parallel finger and injured finger at the end of follow up period were evaluated with Pearson correlation analysis. The results interpreted with correlation coefficient  in which we can define how strong connection between two variables. (Rxy=correlation coefficient, 0.1 <rxy <0.3: weak, 0.3 <rxy <0.5: moderate, 0.5 <rxy <0.7: visible, 0.7 <rxy <0.9: high, 0.9 <rxy <1: very high). 5 patients were diagnosed with hypoesthesia in a small area and 6 patients had positive Tinel’s sign with only strong percussion at the donor field. The patients were not concerned about the area of numbness. No Tinel’s sign was detected on neuroraphy sites when recipient fields were examined. The mean value of 2PDT and SWMT of injured finger is significantly higher than (worse than) the uninjured finger. (p=0, 0001). [See the Table 2]. The defect length and the difference percentage of 2PDT values values (injured finger) is not statistically significantly correlated (p>0, 05) (Table 3). The defect length and difference percentage of SWMT values is positively statistically significant correlated (r=0,557 p=0,048) [Table 3]. Table 3. The defect length and the difference % of 2PDT values is not statiscially significant correlated (p>0,05). The defect length and the difference % of Semmes-Weinstein monofilament test is positively statiscially significant correlated (r=0,557 p=0,048). The mean time from injury to grafting and the mean values of 2PDT with the difference % of 2PDT, SWMT with the difference % of SWMT are not statiscially significant correlated (p>0,05). The age of the patient and the mean values of 2PDT with the difference % of 2PDT, SWMT with the difference % of SWMT are not statiscially significant correlated (p>0,05). The values with ≤3, 84 constitutes the majority. The mean value of SWMT is ~3, 52 in which can be interpreted between the normal and diminished light touch  (Table 4). Table 4. Semmes-Weinstein monoflament test results in 13 patients. The distribution of the values with ≤3,84 constitutes the majority. Two point discrimination test results ,notice the distrubition of the patient , majority of the patient stands below 6 mm. 2PDT values were between 3-5 mm in 5 nerves and 6-10 mm in 8 nerves. The distribution of the values with ≤6mm constitutes the majority (Table 4). The mean value of our 2PD result is ~5,923 in which can be interpreted in normal limits . The mean time from injury to grafting and the mean values of 2PDT with the difference % of 2PDT, SWMT with the difference % of SWMT are not statistically significant correlated (p>0, 05) (Table 3). Despite the mean values of injured fingers are significantly higher than (worse than) the uninjured fingers regarding to these two tests, the majority of the fingers stands near the normal sensation. According to our study, using of lateral antebrachial cutaneous nerve (LACN) as a donor source for mean 18,5 mm - digital nerve defect, improved 2PDT and SWMT measurements after the surgery on mean follow up time 35, 7 months. This study revealed that the increasing defect length worsens the SWMT and % difference SWMFT result. Differently from the previous studies defect length was found to be determinant factor on senstaional regaining in our study. While the % difference 2PDT is not affected from increasing gap size. Small sample size of our study is suggested to be reason of this outcome with large interinduvudial variation feature of 2PDT. The age and the time interval between injury and repair was not found to be effective factor on regaining sensorial function of the digit in our study. The result regarding to age should not be generalized, because the patient sample of our study consisted young and middle aged patient group. So we could not evaluate the age older than 38 years old. The relationship between the age of injury (time interval between injury and repair) and return of sensation were assessed in previous studies (McFarlane and Mayer’s study and Tenny et al’s study) [1, 12]. Both studies concluded that the age of injury (time interval between injury and repair) was not determinant factor on regaining sensorial function of the digit such as our study. This parallelism might be a contribution to scientific knowledge regarding digital nerve injuries. There were a few previously published studies found in the literature that deals with LACN as a donor source. The use of lateral antebrachial cutaneous nerve as a graft for digital nerve repair was initially reported by McFarlane and Mayer  (1976). In their study, the authors evaluated the availability of this autograft in a clinical setting using 13 grafts. They found out LACN was an excellent donor nerve since it is relatively easy to obtain, has a satisfactory/appropriate caliber for grafting and provides a sufficient length for digital nerve grafts. They performed 2PDT and nin-hydrin sweat test to assess return of sensation. The regained 2PDT values were also investigated, but their results were poorer than us in the terms of 2PD criteria. This can be explained by the mean time from injury to grafting and the mean defect sizes are higher than us in their cohort. In contrast with us, they did not seek any correlation between the defect length and values of post-operative regaining sensation. Parallel with us; the age and the time interval between injury and repair was not found to be determinant factor on return of sensation in their study. Tenny et al. (1984) presented a large cohort (42 studies) on LACN auto grafts. The authors reported better clinical results with lateral antebrachial cutaneous nerve (LACN). The evaluation of the patients was done using various testing methods such as sharp versus dull discrimination, heat sensitivity, vibration, dynamic and static two-point discrimination, perception test, texture differentiation and shape identification. They did not find any obvious relationship between the length of the graft or time- interval from injury to grafting and the results. However, they found correlation between the age and the amount of sensory return. Opposingly Tenny et al’s study, we could not find any relationship between the age and clinical results. Our group consist of young people, so lack of older age patients might cause these results. We could not compare our clinical results with this study, because in this study the scale of the British medical research council and other parameters were utilized. Pilanci O et al. presented a cohort (15 patients) that aimed to evaluate recipient and the donor site sensorial results of the lateral antebrachial cutaneous nerve (LACN) in digital nerve restoration. They found out that the restoration of digital nerve defects with LACN graft had satisfactory results. They performed this study on a homogenous patient group that consisted with chronic cases .This feature strengthened their study. In contrast with this study, our patient group were consisted with acute and chronic cases. If we closely examine two cohorts, in our group only two patients had acute injuries, and the other cases had chronic injuries with similar with Pilanci O et al’s group. Also the mean time interval from injury to grafting day were very similar in two groups . (Our study 53,3 days, Pilanci et al’s study 50, 7 days). Chiu CK et al  emphasized the presence of trifurcation on LACN and availability for digital nerve grafting in a letter. There is no single test, which clearly documents of nerve function, and therefore, we combined the most generally accepted methods. 2PDT is the most reliable index of return of sensation [12, 15]. The Semmes Weinstein monofilament has acceptable intra-rater & inter-rater reliability . This test can detect change over time i.e. quality of neural return, progression, or deterioration [17, 18]. Therefore, these two assessment methods were fitted to our search. We used only 2PDT to assess return of sensation and we added SWMT to assess pressure needed to detect touch . Apart from McFarlane and Mayer [] Pilanci O  and Tenny et al’s  cohort study, there were no previous publications/studies regarding the clinical availability of LACN autografting at digital nerve defects. Tank MS et al  did a histomorphometric evaluation of the fascicular pattern of LACN and digital nerves. They reported that the LACN closely resembled the original fascicular pattern of digital nerve and therefore, can be considered as a highly suitable donor for digital nerve grafts. Higgins et al. performed a cadaver study based on microscopic feature of nerves. Their results said that the LACN was most appropriate for Zone 2 and 3 injuries. Tenenhaus M et al  and some various authors reported the advantages of PIN as a donor source for digital nerve grafting from their experience and concluded that this nerve graft affords minimal donor-site morbidity; in addition to having an appropriate size to match for digital nerve grafts distal to proximal phalanx. [3, 20-22] According to the our point of view, to obtain PIN necessitates pronation of forearm. Thus during the surgery hand should stay at two position comparing with one position (supination).This can cause time and concentration loss. Donor nerve selection is heavily dependent on harvesting ease and post-surgical morbidity rates. An ideal donor nerve should be easy to locate, surgically accessible, have sufficiently long segments without lateral branches with small overall diameters and well developed fascia. In addition, the sensory deficit caused by the harvesting should occur in a non-critical cutaneous region . Under some special circumstances where autografting is not available (such as patient not consenting to autografting or a relatively short surgical period is necessary due to patient’s medical situation), nerve conduits can also be used as an alternative to autografting. The main limitations of our study include the lack of detailed scoring systems such as texture differentiation, British Medical Council Scale, American Society for Surgery of the Hand (ASSH) guidelines and Disabilities of the Arm, Shoulder, and Hand (DASH) scores for assessment of functional recovery and small size of our cohort. Based on satisfactory results regarding to sensory regaining at recipient side and negligible sensory deficit and complaints at harvesting side, we suggest that lateral antebrachial cutaneous nerve might be a valuable graft option for digital nerve defects. Moreover, our study suggest that the increasing of the gap size between the nerve ends worsens the SWMT and percentage difference SWMFT results. All procedures followed were in accordance with ethical standarts of the responsible committee on human experimentation (Institutional and national) and with the Helsinki Decleration of 1975, as revised in 2008 (5) .Informed consent was obtained from all patients for being included in the study. The written informed consents were obtained from all the patients. Tenny JR, Lewis RC. Digital nerve-grafting for traumatic defects. Use of the lateral antebrachial cutaneous nerve. J Bone Joint Surg Am 1984; 66(9): 1375-9. Peripheral Nerve Reconstruction with Autologous Grafts, Basic Principles of Peripheral Nerve Disorders. In: Rayegani SM, Ed. InTech. Rijeka, Croatia 2012; pp. 79-92. Stang F, Stollwerck P, Prommersberger KJ, van Schoonhoven J. Posterior interosseus nerve vs. medial cutaneous nerve of the forearm: differences in digital nerve reconstruction. Arch Orthop Trauma Surg 2013; 133(6): 875-80. Rosenfield J, Paksima N. Peripheral nerve injuries and repair in the upper extremity Bulletin Hospital for Joint Diseases. 2001; pp. 155-61. McAllister RM, Gilbert SE, Calder JS, Smith PJ. The epidemiology and management of upper limb peripheral nerve injuries in modern practice. J Hand Surg [Br] 1996; 21(1): 4-13.
 de Medinaceli L, Prayon M, Merle M. Percentage of nerve injuries in which primary repair can be achieved by end-to-end approximation: review of 2,181 nerve lesions. Microsurgery 1993; 14(4): 244-6. Nunley JA, Ugino MR, Goldner RD, Regan N, Urbaniak JR. Use of the anterior branch of the medial antebrachial cutaneous nerve as a graft for the repair of defects of the digital nerve. J Bone Joint Surg Am 1989; 71(4): 563-7. Higgins JP, Fisher S, Serletti JM, Orlando GS. Assessment of nerve graft donor sites used for reconstruction of traumatic digital nerve defects. J Hand Surg Am 2002; 27(2): 286-92. Avialable at: https://www.ncmedical.com/wp-content/uploads/2011/07/Touch-Test-Sensory-Evaluator_11_web.pdf (accessed 2011). Avialable at: http://www.htherapy.co.za/user_images/splinting/Two_Point_Discrimination_2009.pdf (accessed 2009). Avialable at: http://pages.intnet.mu/cueboy/education/notes/statistics/pearsoncorrel.pdf (accessed 2005). McFarlane RM, Mayer JR. Digital nerve grafts with the lateral antebrachial cutaneous nerve. J Hand Surg Am 1976; 1(3): 169-73. Pilanci O, Ozel A, Basaran K, et al. Is there a profit to use the lateral antebrachial cutaneous nerve as a graft source in digital nerve reconstruction? Microsurgery 2014; 34(5): 367-71. Chiu CK, Ng ES, Ahmad TS. The use of a trifurcation of the lateral antebrachial cutaneous nerve for digital nerve grafting. J Hand Surg Eur Vol 2009; 34(4): 540. Novak CB. Evaluation of hand sensibility: a review. J Hand Ther 2001; 14(4): 266-72. Avialable at: http://www.htherapy.co.za/user_images/splinting/Monofilaments.pdf (accessed 2009). Bell-Krotoski J, Weinstein S, Weinstein C. Testing sensibility, including touch-pressure, two-point discrimination, point localization, and vibration. J Hand Ther 1993; 6(2): 114-23. Cırpar M, Arı M, Türker M, Ekşioğlu MF, Cetik O. 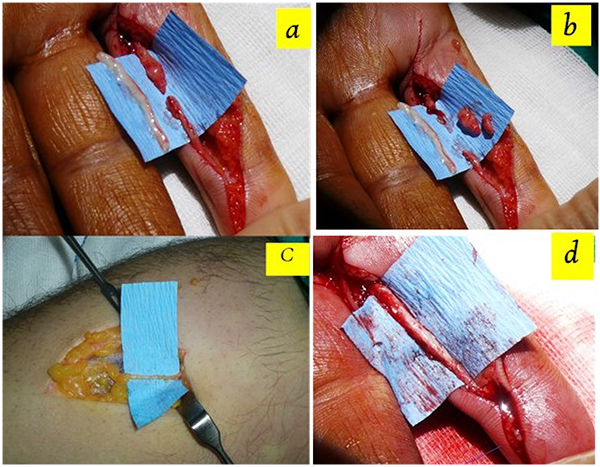 The efficacy and safety of limited incision technique in carpal tunnel release. Eklem Hastalik Cerrahisi 2011; 22(1): 33-8. Tank MS, Lewis RC Jr, Coates PW. The lateral antebrachial cutaneous nerve as a highly suitable autograft donor for the digital nerve. J Hand Surg Am 1983; 8(6): 942-5. Tenenhaus M, Bhavsar D, Rennekampff HO. The posterior interosseous nerve as a donor source for nerve grafting: a concept revisited. Plast Reconstr Surg 2005; 115(4): 1215-6. Waters PM, Schwartz JT. Posterior interosseous nerve: an anatomic study of potential nerve grafts. J Hand Surg Am 1993; 18(4): 743-5. Elgafy H, Ebraheim NA, Yeasting RA. The anatomy of the posterior interosseous nerve as a graft. J Hand Surg Am 2000; 25(5): 930-5.